Different dial layout and larger LCD display panel. Where the Fairmont cluster has two plugs, a 20 pin LHS ( Left Hand Side ) and 20 pin RHS ( Right Hand Side ) to be plugged into the dashboard loom ~ the LTD cluster has four plugs. The RHS plug remains the same with the same pin wiring however there are now two plugs on the LHS: a 16 pin and a 12 pin. The 16 pin does the same work as the previous Fairmont 20 pin LHS plug but the additional 12 pin plug is dedicated soley for the door ajar circuit. On the back of the LTD cluster there is an additional 4 pin plug for the "bulb out" warning lamps connecting to the stop lamps and the park lamps. I have not yet wired up the "Bulb out" warning system as yet as the wiring colors seem to conflict with what the Ford Workshop manual states. I'll get around to this in the near future. One final item needs to be dealt with too: the Fairlanes have a slightly different circuit wiring for their electrical towpack trailer plugs as opposed to the Fairmonts and needs to be re-routed to prevent damage to the LTD cluster. Because I have yet to re-route the circuit I do not use the trailer plug and so I would like to point this out to anyone who currently does use their trailer and plug setup and is wishing to install the High Series cluster ~ be aware that until it is rerouted, using the trailer plug after installing the LTD cluster may damage the LTD cluster. After a ride in an NL Fairlane I found that its dash cluster was a much nicer unit to look at and certainly more unique in design and layout than my original Fairmont Ghia cluster. It had a snazzy looking door ajar system and even had a "bulb out" warning indicator and so I decided then and there to install one of these clusters into my own EL Ghia. 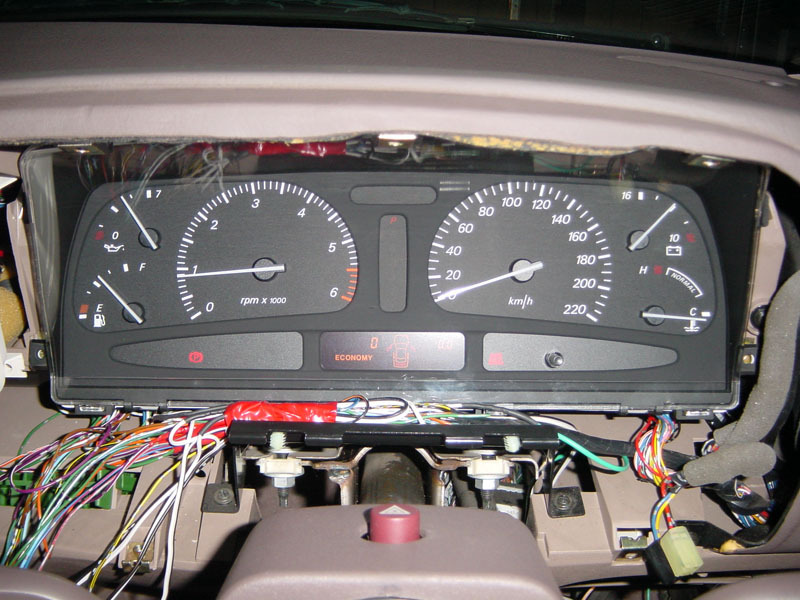 I was able to purchase a brand new unused LTD cluster from a private sale and all that was left to scrounge for the cluster conversion were the door sensors and reed switch. The door ajar circuit within the LTD cluster is designed to sense the impedance of individual door sensors and so when a door is closed, the door sensor mounted on each doorlock sends out 180 Ohms to the cluster which interprets that the door is "closed." When the door is opened the sensor will then send out an impedance of 1.2 K Ohms to the cluster which interprets that door as "open." The fuel filler sensor is a reed switch which uses the same impedance to indicate to the cluster that the fuel filler door is either "open" or "closed." The boot status is the only indicator on the cluster's door ajar circuit that does not use impedance, it uses 12v for open and closed. 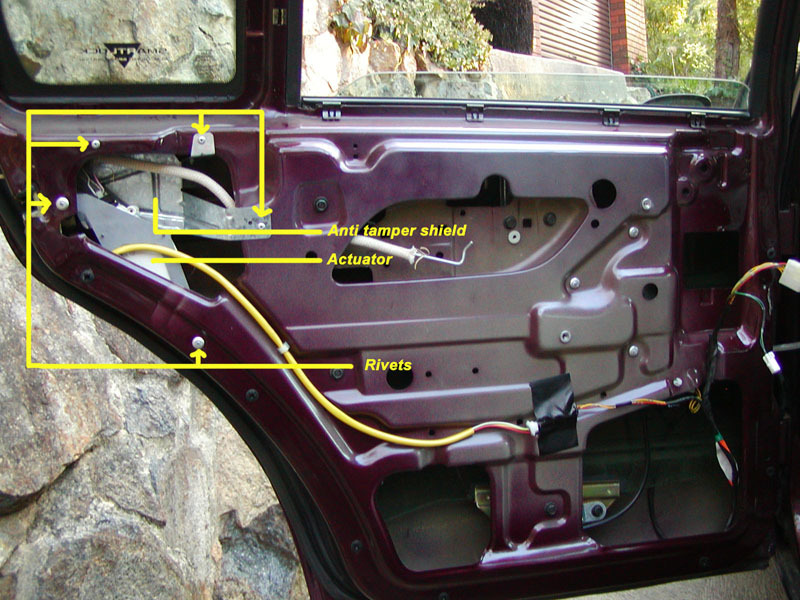 I decided to wire up the LTD's door ajar system with the Ford door sensors and removed a complete set along with the fuel filler's reed switch from a wrecked Fairlane. The advantage of using the Ford sensors is that if you close a door and it only clicks once and is still slightly open, the door sensor continues to send an "open" signal to the cluster advising you that the door is not properly closed. This is exactly what the door ajar setup is designed to detect: that small gap and inform you of that, as opposed to wiring them up to the door lamp switches mounted in the door frames which will show "closed" well before the door lock is even touching the striker. From the same Fairlane wreck I was able to remove its dash cluster's four original plugs with approx 15cm of loom wiring for each plug as this would make the cluster easier to install than hardwiring individual plug wires. This was the first part of the conversion I started with - the door sensor installation. If you have never had to pull the trims off your doors before and fiddle with the door's components for any reason then be prepared to spend hours disassembling the doors to get to the doorlocks. For the back doors, pull the trims off and drill out the rivets holding in the Tibbe actuator and the metal anti-tamper plate behind it. 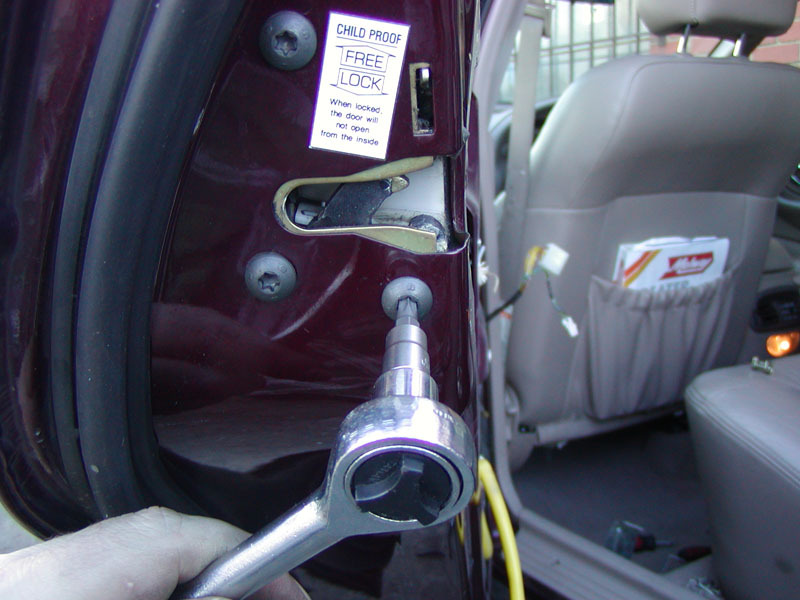 Disengage the individual rods from the actuators to the doorlocks as well as the door handle rods from the doorlocks. Note: be careful with the door handle's plastic rod clasp as it is easy to break - it just needs to be flicked open with a flathead screwdriver. Don't use excessive force! Once the rods are disconnected you just need to unbolt the closest one of the windows runner guides and angle it out of the way so that the doorlock can come out easily. Now undo the door lock with a torx socket T-30 and it should just slip straight out from the inside of the door. Now the easy part. Take a sensor and click its plastic hooks into the matching slots on the doorlock as shown in the accompanying photo and that's it - door sensor mounted. From this point just reassemble the door in reverse order and have a set of nut & bolts to replace the rivets that were originally holding the actuators and anti-tamper plates in place. For the front doors it's much the same except this time there is no need to remove the actuators as they are located further down and out of the way. The drivers door does have an additional rod between the doorlock and the keylock. Other than that it's pretty straight forward in disassembly, sensor attachment and reassembly. 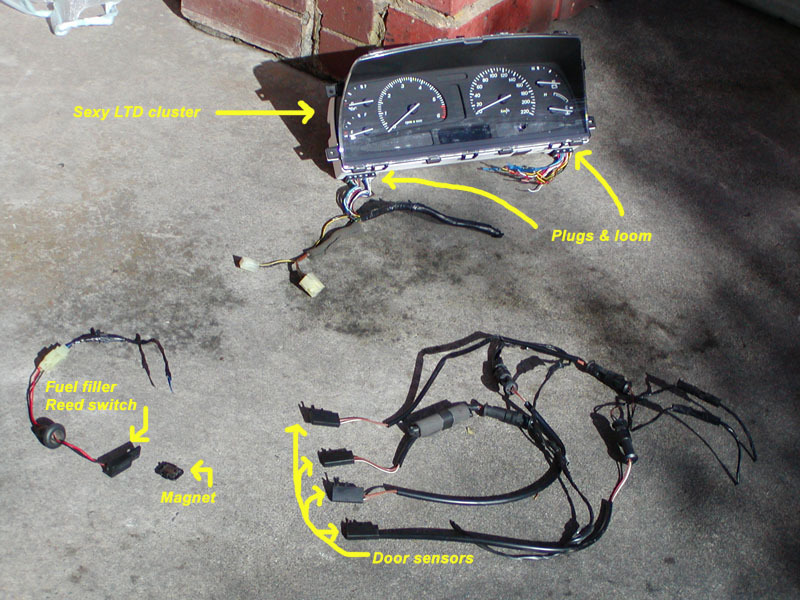 Once you have fitted all four door sensors you can test them for impedance ( resistance ) if you have a multimeter handy by placing the meter's probes onto the sensors wires and closing the door. When closed the meter should read 180 Ohms and 1.2 K Ohms when you open the door. If they measure up then you have successfully completed the door sensor installation. This sensor is the easiest to install by far. All you need to do is remove the original rubber grommit to the immediate left of the fuel cap, slip the fuel filler's sensor wires through and seal the hole with the rubber grommit attached to the sensors wiring. The sensor itself just attaches to the metal frame on the left of the cavity with a self tapping screw. The remaining item to be inserted is the mounted magnet which attaches into the vacant slot on the inside of the fuel door. A suggestion here: this sensor is one of the longest distances from the dashboard so prepare ahead by soldering on the extension wires and insulating them with heatshrink or electrical tape to the fuel sensor wires before installing into the fuel door cavity. On the righthand boot hinge is a thick black cable for the boot release which has three wires contained within. They should be purple, black and white. Splice and solder a long length of cable into the white wire and run that all the way down the side of the chassis up into the dash cluster area and into pin 8 of the 12 pin plug. Seeing as this just runs off the 12v rail it is all you need to do to get the boot status to work on the LTD cluster. Now to get the sensors wired all the way to the dash you need to get fiddly with the pillars and chassis rails. You'll need at least 20 to 30 metres of twin core wire for this stage which you'll be cutting up as needed for each sensor to be run through its own A or B pillar and along the chassis rail. I started with the fuel filler sensor location and exposed the space behind the boot's side interior covering the fuel cavity. As the wire comes up behind the back seat it was necessary for the back seat to be removed so the wire could be concealed underneath it. The backseat can be removed by pushing the base of the seat backwards towards the boot and then upwards. This action must be done on both the left and right hand side of the backseat as that is where the mounting points are on the floor of the car. You'll find the seat base to be quite light and easy to remove from the car after detachment. Removal of the rear scuff plate allows access to the space alongside the chassis rail under the carpet so you can then place you sensor wire from the boot to run down onto the floor and then into the area under the scuff plate's carpet and then all the way along to the front passenger footwell up to the ECU. 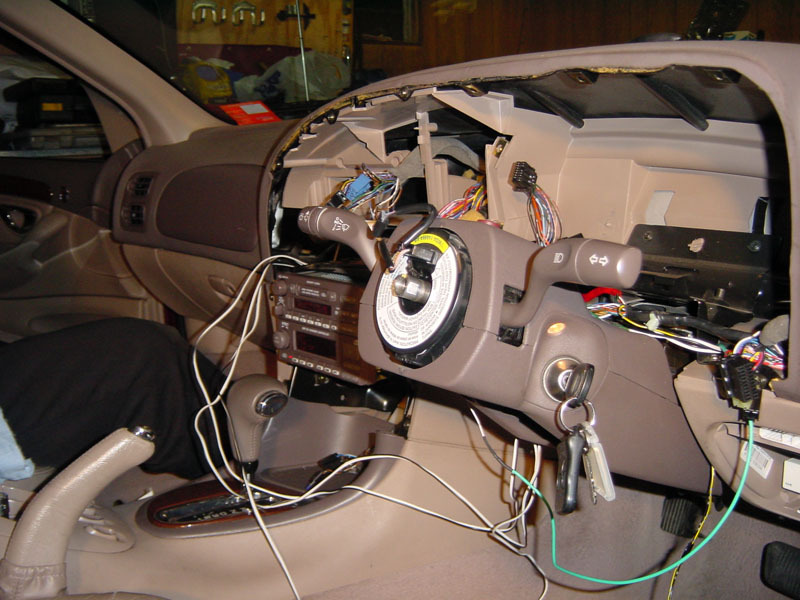 From this point its just the doors sensors left to wire all the way to the dash. I found it easier to pull the front seats out for the extra room needed to manouver when going through the B pillars so you'll need a T-50 Torx socket to unbolt the seat from the floor and to remove the seat belt anchor from the chassis rail which will give you access to a small hole in the chassis rail underneath the B pillar. The other hole is on the outside of the B pillar and currently is filled with the normal power loom running through for the rear doors. You need to pull the rubber weathershield grommit out to allow the new wires to route through these holes. The rubber weathershied grommit does actually have room for the extension wire to run through alongside the rest of the power loom once you remove the original black tape covering the end of the grommit as shown in the photo here. The extension wires can then be brought through the back doors grommit in exactly the same fashion. Now you just need to pull enough extension wire through the B pillar via the holes and into the door to allow connection and soldering with your door sensor wires. 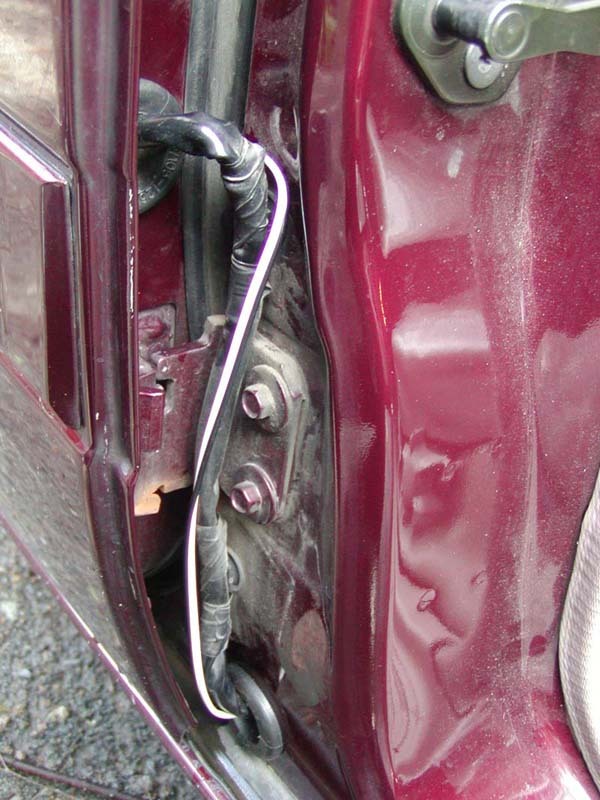 Repeat the same for the rear door on the other side of the car and run the extension wires up to the front of the car allowing for sufficient wire length to run across the dashboard to the cluster's location. Remember to re-tape the loom between the B pillar and the rear door to weatherproof it from the elements. The front doors need to be wired up in the same fashion and the holes for access to the power loom running between the A pillar and the door is behind the front kickpanels. Use the same method of running the extension wires through the weathershield grommits and into the doors to each door sensor, connect and solder, insulate the join and re-tape the power loom upon reassembly. That's it - all sensors are wired. If you'd like you can just test sensors for correct impedance again with your multimeter to ensure they are operating correctly before you reassemble your interior and move onto the next stage. For this stage the steering wheel was pulled off to give more room to splice and solder the wires for the new cluster as I didn't want to accidently burn or damage the leather wheel in any way. Detach the console fascia which is held in with philips head screws. Gently pull the fascia away from the rest of the dashboard by about a centimtre or two so that you can get your fingers behind to disconnect the plugs for the trip computer, antenna & demistor buttons, central locking button and the boot & fuel door buttons. Once disconnected the fascia can be removed. The original cluster can then be easily unscrewed and disconnected from its plugs. From here its relatively straight forward. Have your Ford manual handy to identify the colors and function of the original 20 pin plug wires and then look up the wires and function of the LTD's 16 pin plug's wires. Once matched, you can either leave in the original 20 pin plug and splice the new LTD 16 pin plug into the existing loom as well ( in case you ever need to put your original cluster again ), or, you can just cut off the original 20 pin plug and directly connect its wires with the wires on the new 16 pin plug. I chose to keep the original plug and spliced in the new LTD plug. Remember to use the electrical tape to insulate all solder joins and bared wire ends as there is a fair bit of metal plating within this dashboard. 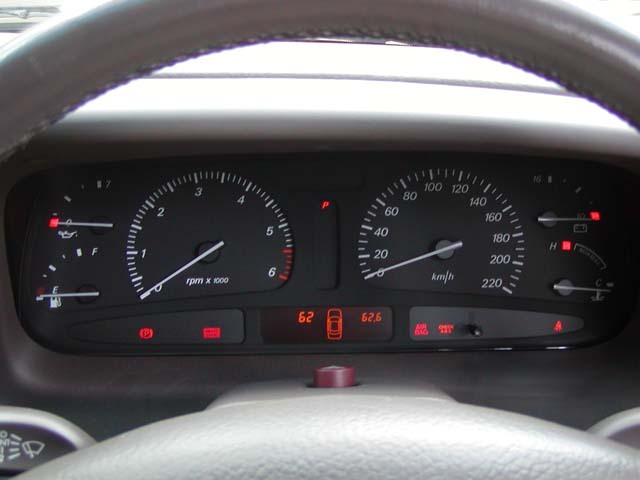 Once you have done this you can turn the ignition to the "on" position and see if the new cluster lights up properly. If it does then you can move onto the 12 pin door ajar plug. This plug will of course be quicker to attach as only half the wires need to be connected. Using the Ford manual or Xyphoid's technical doco EF/EL Instrument cluster info, locate which pin on the 12 pin plug is for which sensor location and connect accordingly, then take the remaining single wire off each sensor and ground it to the GND pin on the plug and that's it. Plug your cluster in again and turn the ignition "on" to see if your door ajar status on the cluster is working. NOTE: Xyphoid's technical doco informs on how to swap the odometer memory from your original cluster to the new High Series cluster. 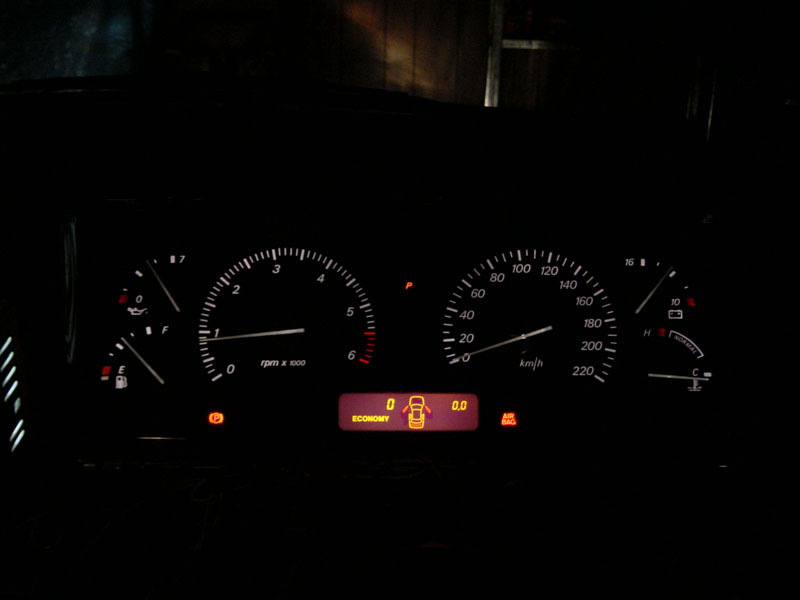 This dash cluster modification is incomplete as the last two items ( bulb-out warning / trailer plug ) have not yet been satisfactorily completed. Document written by: Vic on 19 2006>, Copyright © 2006 Vic, all rights reserved.